(HealthDay News) -- Older patients with a broken hip are more likely to die after the fracture if they're discharged from the hospital early, according to a study published Feb. 24 in The BMJ. The researchers analyzed data from 116,111 people aged 50 and older in Sweden who were admitted to the hospital with a broken hip between 2006 and 2012. The patients' average age was 82.2 years. 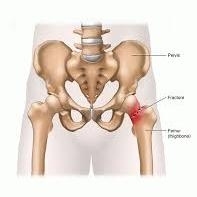 The average hospital stay for a broken hip in Sweden fell from 14.2 days in 2006 to 11.6 days in 2012. Five percent of the patients died during their hospital stay, 5.5 percent died within 30 days after leaving the hospital, and 25.9 percent died within one year. In a related commentary, University of Toronto experts pointed out that "health care systems around the world are constantly urged to do more with less." But, they stressed, early discharge from the hospital needs to be considered on a patient-by-patient basis.